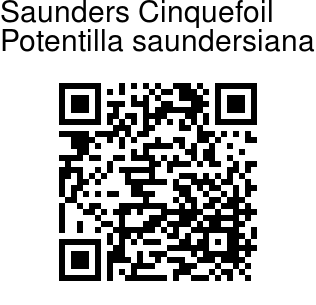 Saunders Cinquefoil is a low growing perennial herb. Rootstock is slender, single or grouped together. Floral stem can grow up to 10 cm long, floccose-tomentose, ascending, but may be smaller too. Basal leaves are few, 5-foliate, stalks 1.0-2.5 cm long, velvety with long straight hairs intermixed. Basal stipules are overlapping, membranous, auricles oblong-linear, acuminate, cauline stipules ovate, leafy. Leaflets are obovate, 0.7-2.0 x 0.4-0.8 cm, upper surface covered with prostrate hairs, green, lower surface white-velvety with long hairs on midvein and edges, generally divided up to half with 3-7 pairs of teeth. Flowers are yellow, 0.8-1.0 cm across. Sepals are nearly equal, pointed, hairy. Petals are about 5 mm long and broad, inverted-heart-shaped. Stamens are about 15-20. Carpels are many, styles subterminal, about 1 mm, uniformly thickened. Seed-pods are are 1.2 mm long. 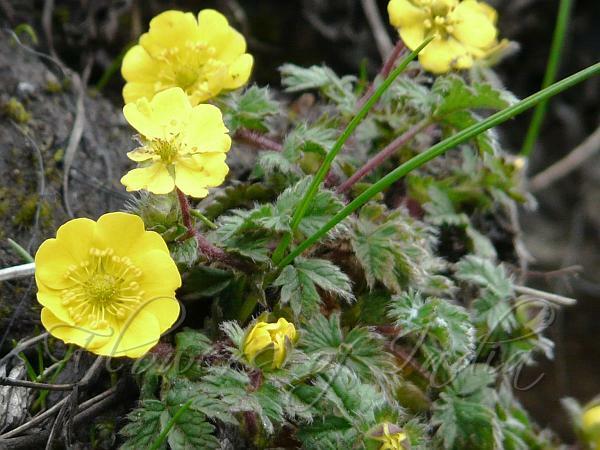 Saunders Cinquefoil is found in the Himalayas, from Kashmir to Nepal, Bhutan, Sikkim. It is common in Eastern Himalaya, at altitudes of 3500-4500 m.